Southeastern Galleries has always been a different kind of furniture store. Family owned and operated since its inception over six decades ago—originally across Meeting Street from the Charleston Museum—Southeastern Galleries has separated itself from the competition by offering its customers more than just a place to buy a couch or a chair. Southeastern Galleries began hiring designers—in the beginning, many of them were military wives—and soon offered its clients in Charleston and the surrounding towns the services of a complete home furnishings store. Now on Ashley River Road, Southeastern Galleries has grown, but it’s still a family affair. Bill’s son, Rick, is the senior vice president, while his daughter, Trudie Cooper Krawcheck, and his grandson, Randolph Cooper, are designers. Grandson Will Cooper also plays a role as a graphic designer. 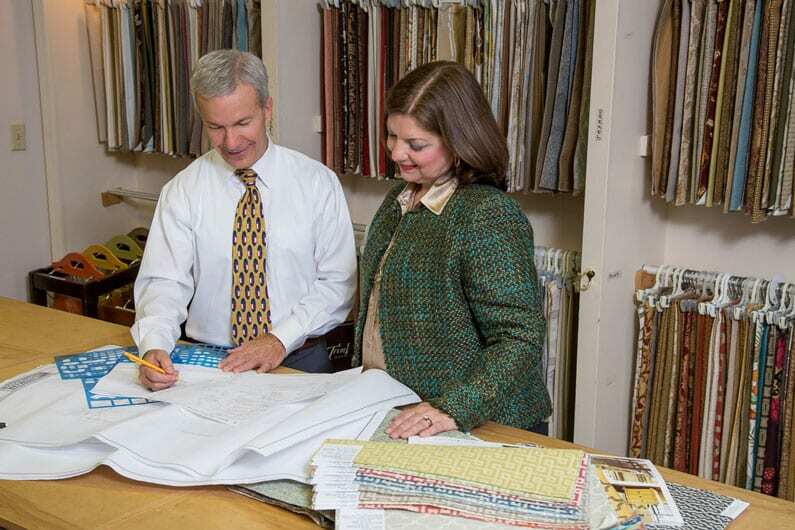 Unmatched customer service has been Southeastern Galleries’ driving force from the beginning. A Citadel graduate with a business degree and a Korean War veteran, Mr. Cooper had no experience in the world of furniture when he and Mr. Cannon opened the store on Meeting Street. But they knew they wanted to set themselves apart from Charleston’s other furniture outlets and succeeded in that respect. Today, Southeastern Galleries serves customers as far away as Chicago, Michigan and the Florida Gulf Coast and all the way up the Eastern Seaboard, in Washington, New York, New England and beyond. Despite its success and expansion to places outside the Lowcountry, the company has not swayed from its dedication to serving the needs of local customers. Mr. Cooper points out that the growth of Kiawah, Seabrook and Wild Dunes has played a role in his company’s expansion and evolution. Southeastern has completed projects at vacation homes on the islands, and, when their owners need to furnish their homes elsewhere, they’ve called on Southeastern Galleries to do so. Others have moved away from the Lowcountry but remained clients of Southeastern Galleries. Southeastern Galleries’ designers are a major reason customers keep coming back, Mr. Cooper says, noting that design services are complimentary after they make their purchases. “Our designers are a wonderful and talented group and very important to us,” he says. How has the furniture business changed since Southeastern Galleries opened its doors in the 1950s? He points out that downsizing is now an important aspect of the furniture industry. Many of Southeastern Galleries’ clients are moving from large houses into retirement or resort homes or even assisted living facilities. That might not be the case in the future, but, regardless of how the industry evolves, Southeastern Galleries will be there to take care of the design and furniture needs of their loyal clients—from the purchase of their first home to their beach house and everything in between. “The only thing we can be sure of is change,” Mr. Cooper says.